When choosing an excavation contractor, it may seem like any old place will do. So long as the job gets done, who cares who does it, right? As it turns out, it matters a great deal. You don’t want good, you want the best. Here are three reasons 4 Warriors should be your first and only choice. 4 Warriors stays ahead of the game by implementing the latest in hydro excavation technology. While other companies still rely on outdated methods such as manual labor and heavy machinery, 4 Warriors uses hydro excavation. This revolutionary modern device uses pressurized water and vacuum technology for extremely precise digs and immediate dirt removal. With this design, they can operate more quickly, efficiently, and safely than leading competitors. With more than six years of experience with both industrial and civic projects, the 4 Warriors crew are excavation veterans. They have received extensive training and worked on some of the biggest projects in the state including substations, refineries, and nuclear facilities. Additionally, they hold TWIC certifications, OQ certification, drug testing, and JSA procedures. They hold site-specific training so they’ll be prepared for any job, no matter how unique or complex. This way you know that when you choose 4 Warriors, you’re choosing a team that has been tried, tested, and can deliver on the results you need. Another underappreciated, though no less important, aspect of 4 Warriors is its guidance by traditional and Christian values. The title means “Warriors of Christ” and that devotion is reflected in their work. A family-owned organization, they seek not only to excel in their industry but to make meaningful change in peoples’ lives. The Lord tells us to serve one another, and high-quality excavation is their means to serve the community as much as possible. 4 Warriors Hydro Excavating’s highly experienced team can assist you will all your excavation needs. Feel free to contact them at any time. Thank you and God bless! Trying to find a reliable excavation company can be tricky, especially when you’re on a deadline. Ask yourself these three questions as you’re searching to make sure you end up with the right excavation company. 1. Do they offer a wide enough range of services? When you’re trying to get a lot of work done at a construction site, the last thing you want is a lot of single-function tools or teams clogging up the workspace. Not only does it make it harder for everyone to complete their jobs, but overcrowding is also unsafe. It can also increase your liability for injuries or damages. So when you know you need excavation work handled, look for a service that can provide everything you’re looking for. 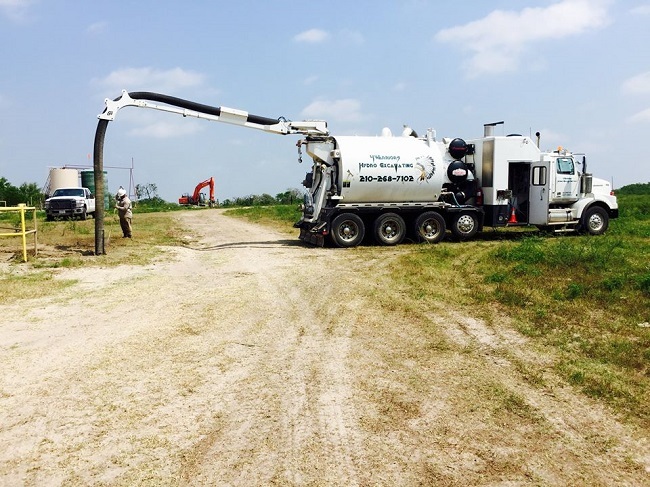 At a minimum, search for hydrovac excavation, daylighting, and trenching from one service. 2. Do they just rent out equipment, or do they perform the service? Depending on the project, it’s often better to hire third parties for specialty work than it is to have your employees perform a technical task they aren’t trained for. Just like you’d bring in a trained electrician to lay the wiring instead of trying your hand at it, don’t just look for excavation equipment. Look for a service that has a trained pair or team of professionals handle the excavation from start to finish. 3. Do they make quotes and scheduling simple? You don’t have time for delays or uncertain pricing. When you’re comparing services, look to see who offers a wide variety of contact methods. You need to be able to easily contact them through email and over the phone. If their site has easy contact forms and a quick response time that’s even better. Not only are delays costly, but poorly organized systems are also a sign the company might not have much experience. 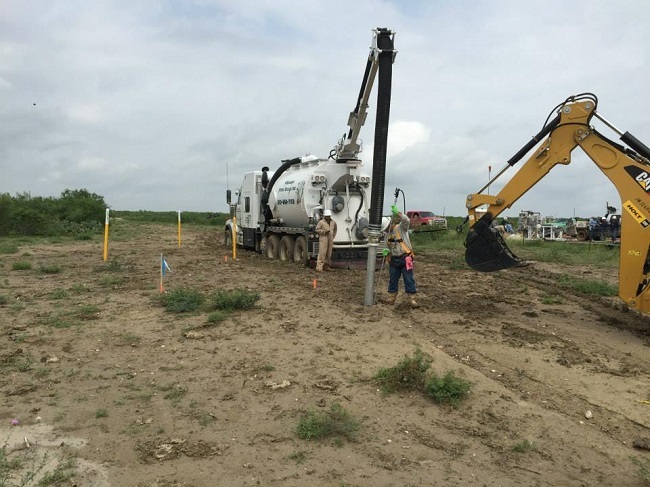 If you’re looking for the right company to handle excavation at your Texas site, contact us at 4 Warriors Hydro Excavation. Our excavation services are exactly what you’re looking for. Every area of construction comes with a lot of regulation and liability. Whether you’re building on undeveloped land or making roadside repairs in the middle of a densely urban area, it’s important to protect your company from claims and legal action. One of the best ways to do that is by hiring third-party services for every part of the operation besides your core business function. Hiring a service instead of renting trucks or equipment often puts the liability on the service. Excavation is particularly full of risks. There is the risk of damaging utility lines and causing minor emergencies in the surrounding area. The trucks or pumps might damage the immediately adjacent area. Trucks, in particular, carry increased liability for roadways obstructions, traffic accidents, and weight limits. But third-party excavation experts know when, where, and how to operate their equipment to comply with local laws and limitations. Their business isn’t just to excavate lines and utilities. It’s to do so safely and with minimal disruption to the surrounding area. Hiring a third party is not a complete guarantee since claimants and their insurance providers will make claims until something sticks or a party is found primarily responsible. But hiring professionals not only protects your company better in the event of a claim, it can minimize the risk of a claim in the first place. Check the company’s insurance coverage and reputation. The more you know about a company before contracting with them, the safer your own company is. Check with their online reputation, past customers, and their insurance policy before finalizing an agreement. Professionals know you need assurance for your own professional reputation, and any sign of hesitation could indicate that something is wrong. We look forward to giving your company optimal excavation services. Browse our site for images of past jobs, reviews, and our business details. Hydro excavating is an example of new technology that is inching its way into commonplace in the world of construction. The optimal choice for digging underground to locate a buried utility is by using a high-powered vacuum excavating machine. What are the essential qualities of a reliable excavation contractor? A Proven Safety Record is a must. This information is public record. Clients should insist to see the contractor’s record. ISNetworld contains every reputable contractor’s safety records–from major to minor incidents of record. 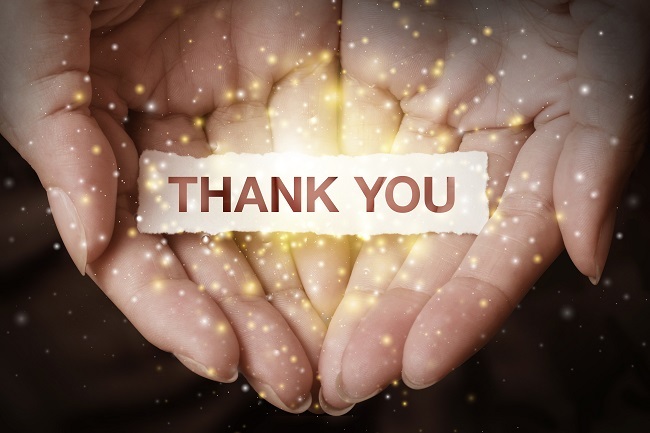 A contractor with an admirable safety record maintains a culture of thoughtfulness and concern, one which sweats every small thing for its customers and its employees. Similarly, A Culture of Customer Love must shine through every facet of the company. So many constituent parts make up a project; and, often times, excavating companies struggle in getting all of its departments on the same page. The right company will be able to swiftly work through these issues. When the end goal is exceeding a customer’s expectations, communication becomes even more imperative, and choices which seemed difficult become clear. Up to Date Training shows a contractor’s prioritization of availability and expediency on job sites. Nothing means lost time like a contractor who is not aware of the requisite training for high profile work. Did you know some government and utility contracts require more than just OSHA 10 safety training? Some require OSHA 40; nearly all require contractors to complete job site specific training. If a contractor is not current with these various training programs, time will be lost–further, mistakes and costs will likely accrue. And finally, customers should insist on The Latest in Hydro-Excavation Technology. The days of excavating with a backhoe are numbered. Hydro-Vac trucks provide a safer and swifter alternative, and they can work in a very large or extremely localized location. At 4 Warriors Hydro Excavation, we fulfill all of these requirements, and we have been doing so since our inception. We use hydro-excavation not only because it is cost effective, but because it is the best tool available to serve our customers. Contact us today for any questions you may have or proposals you may need. 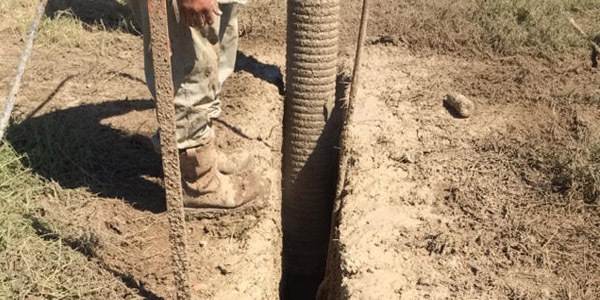 Digging precise holes into the ground is an important step in completing a number of jobs including installation of plumbing pipes, posts, and other materials. 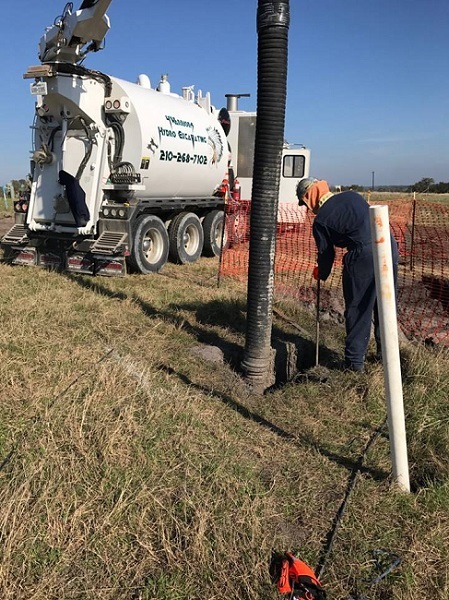 While there are several different ways that you can go about digging and creating these holes, one great option to consider is hydro excavation as it provides a range of unique benefits. One of the benefits of hydro excavation is that it allows a user to create more precise holes than other methods. When using professional digging machinery, it is nearly impossible to dig a precise hole on the first attempt. This then requires someone to back fill the holes. When using hydro excavation, it is much easier to create the perfect hole on the first attempt. The process of hydro excavation is also much safer and cleaner than other digging options. While digging a hole with machines and shovels requires a lot of labor and is more dangerous, hydro excavation is much safer and has much less risk of injury. 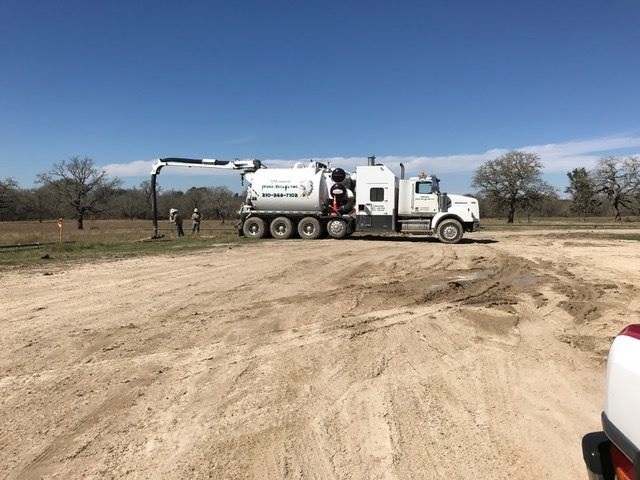 Furthermore, hydro excavation does not require that you use heavy machines that have a tendency to leak fuel and create an environmental risk. All of the water used in the hydro excavation is natural and clean. While hydro excavation provides a safer and more precise product, it also is more affordable. 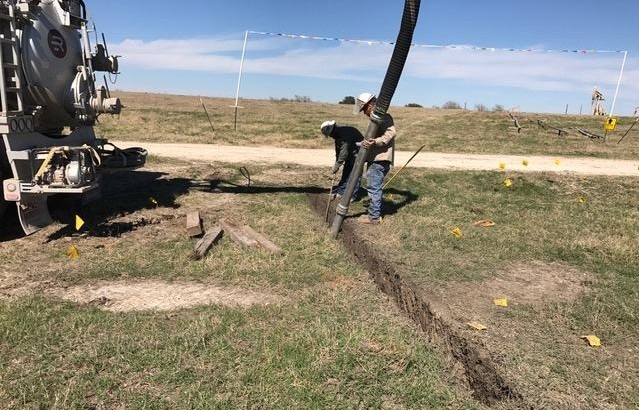 Since hydro excavation is a more precise process and does not require as much time to back fill the holes, you will save a lot of money on labor costs. If you are interested in hydro excavation, contact us to learn more. Hydro excavation services are needed for many different contractor jobs. They help to safely locate pipes, electrical lines and other things that are buried in the ground. The methods were first discovered in Canada when hot water was used to help remove frozen soil. The methods and services became perfected and increasingly popular in the United States. The processes involved are popular because they’re very affordable, quick and safe. They involve the use of pressurized water which softens and breaks up the ground surface. At the same time, a powerful vacuum is used to draw in the dirt and water combination into a tank, so it can be safely deposited elsewhere. As the ground dirt is removed, other things are revealed such as electrical lines, pipes, and cables. There are specific processes and terms that are associated with hydro excavation. Exposing underground cables so the sunlight can shine on them is called “daylighting“. Ensuring that underground items can be easily seen helps to improve safety. It also enables others to work more quickly. Potholing and trenching describe different ways that ground dirt is removed for specific purposes. For example, potholing is used to locate underground objects that are already known to exist so the contractor can have a better idea of the depth and sizes that are involved. Trenching exposes larger underground areas to discover what’s there, or to make it easier for certain jobs to be done. 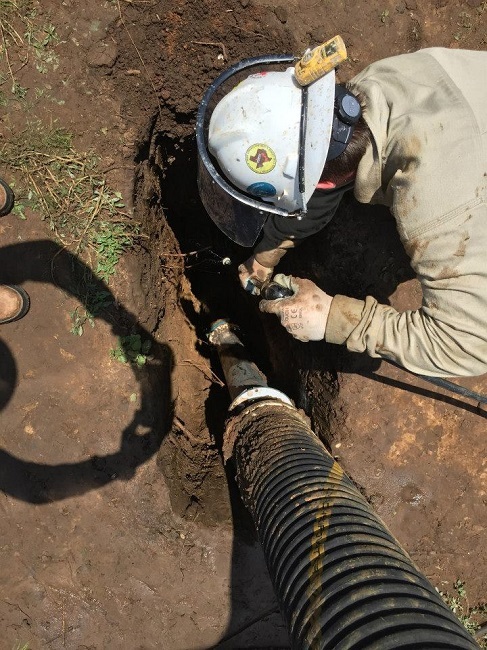 Hydro excavation services are needed in a variety of industries such as home and business builders, pipeline companies, utility contractors and by engineering specialists. Do you have any questions about hydro excavating? Please contact us so we can help. Excavation has always been a messy business of digging dirt out of where we don’t want it. Typically we think of heavy equipment and piles of dirt, and anything that gets in the way is often damaged. Hydro excavation is not that way. There are no piles of loose dirt, no damage to utilities, and no possibility of blowing dust from this process, making the area cleaner and safer for everyone. This process uses pressurized water to cut the soil away from the places we don’t want it, and a powerful vacuum to remove the slurry created by the digging process. It is a cleaner process all the way around, and the vacuum deposits the debris from the excavation into tanks for easy handling and disposal. Hydro excavation is the safest method available for digging. A big reason for this is underground utilities. Even when you think you know where they are and which way they go, it seems heavy equipment has a knack for finding underground utilities. This is an expensive hazard as well as a dangerous one. It leads to loss of utility service in the area and can lead to personal injury or even death in extreme cases. Hydro excavation will uncover these lines without damaging them, which equates to a safer environment for everyone. Another reason for using hydro excavation is it works in almost any soil condition. The water not only cuts the soil away but also acts as a lubricant in the digging process. This method can even excavate frozen ground because we can heat the water used in the process effectively melting the ice as we excavate the ground. At 4 Warriors Hydro Excavating, our expertly trained crew can handle any excavation job. Our operators have been in the industry for more than six years, and they have the advanced safety training required for work in refineries, substations, and even nuclear facilities. We have been involved in some of the largest projects in Texas. Please contact us for more information. Day lighting is the term for exposing utility lines to daylight for the purpose of verifying the exact depth and location of the lines. This is primarily done to avoid hitting these lines with heavy equipment when doing construction in the area. Traditionally, these lines were dug out by hand. This is a slow labor intensive method, which sometimes results in damage to the line and on rare occasion results in the injury of a person who “finds” it. A backhoe, while faster, is cumbersome to use for this and increases the risk to the utility lines. Not only that, but either of these methods results in a large hole, a big mess, and a huge pile of loose dirt. 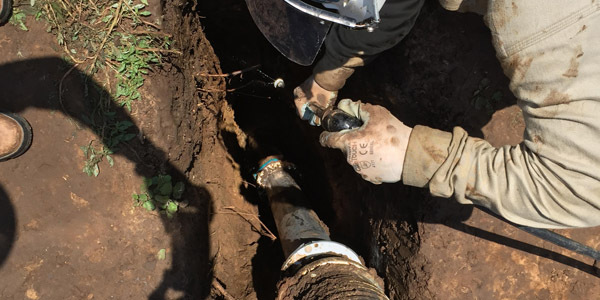 Hydro excavation is the process of using pressurized water coupled with a vacuum to dig a small precise hole to find and expose the utility lines. We direct pressurized water into the ground with a hand-held wand, which makes a fairly small hole. A powerful vacuum removes the slurry debris created by the process, which is then deposited in a debris tank. The lines are found without risk of damage or injury, and the dirt from the process is not sitting there in a heap. Best of all, the hole stays small, so small that the process is also called potholing, because of the small neat pothole-sized opening and the minimal damage to the surrounding area. 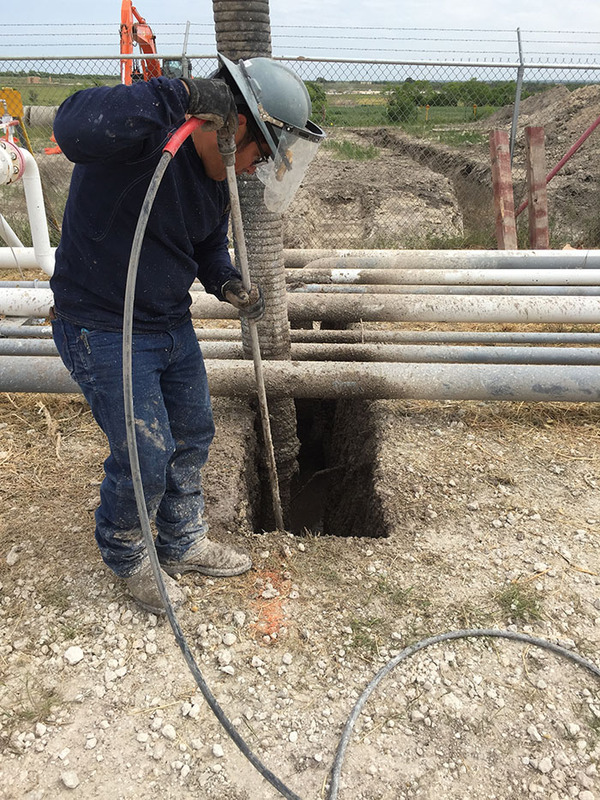 At 4 Warriors Hydro Excavating, our professional crew is well-trained in all aspects of day lighting excavation. Please contact us to effectively locate underground utility lines and pipes using our state of the art hydro excavation systems. From time to time underground pipes should be examined for cracks and damage. It is impossible to see what is going on underneath the soil, but also very important to know for proper maintenance and upkeep. Therefore a method of revealing these buried pipes to the daylight, otherwise known as “daylighting”, is commonly used. In the past a backhoe or a hand shovel would have been the only choices for this process, often being time-consuming and incurring a hefty cost. But today the technology of hydro excavation is making all the difference! Using pressurized water to remove soil and a vacuum to transport it, hydro excavation is the most cost and time efficient method of daylighting. This is because the process is precise and accurate, eliminating additional costs due to repairs that often occur when heavy machinery is used to expose piping. Hydro excavation also reduces the need for a large crew of workers, keeps congestion at the project site at a minimum, and is environmentally friendly. With less mess, less expense, and less risk of pipe damage, this unique method will exceed your expectations. Here at 4 Warriors Hydro Excavation we are a family and we aim to take care of your family. Putting a smile on your face is important to us! Just as being the safest, most reliable, and most cost-efficient hydro excavation company is to us. If you find yourself needing to expose underground facilities, please contact us and we will be more than honored to help you with our technology and extensive training! We are already a couple of months into 2017, but even as Christmas has passed us by, the spirit of the season lives on into a bright, new year of wonder. From enjoying time away from the daily grind to holding fast to the joy we got to see spread across their faces on Christmas morning, we were right there along with you – just like we are all throughout the year. Together we are doing great things and it is truly a blessing to be a small part of your businesses, your projects, and your lives. When we started this business, we had one thing in mind… doing what we do best and doing it to the glory of God. One of our favorite Christmas songs has always been The Little Drummer Boy. Here at the holiday season, we are always reminded that, just like the kid in the song, we are just ordinary, blue-collared guys who have been lucky enough to be a part of the extraordinary gift… the gift of knowing what we do well and knowing Who we do it for. We always strive to “play our best” for Him… even from atop our excavator trucks. We hope that you notice this in our kindness, our dedication and our commitment to being more than a business, but family. We are all here doing what we love because He first loved us.